One of the most exciting outcome of our project is the toolkit we have created for youth workers. 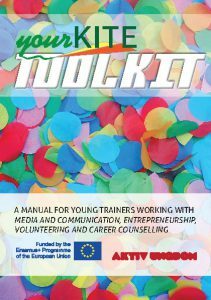 The toolkit is a comprehensive guideline including practical tools for conducting workshops in volunteering, entrepreneurship, career counseling, and media and communication. Download the toolkit in ENGLISH here! Download the toolkit in NORWEGIAN here! Download the toolkit in POLISH here! Download the toolkit in ROMANIAN here!